Begin serving for points using Coach April's 10 float serve volleyball tips. The floater serve in volleyball, whether standing or jumping is one of the best serves to use to score points from the service line. The floater serve, when practiced and done correctly, is used by top high school, collegiate, pro indoor and beach volleyball players to score points consistently. The floater is popular because if contacted in the right spot, the ball will dip, float and move as it travels across the net. Once across, it will just drop straight down making it difficult for a passer to pass it to their target. In my playing career, I've used all types of serves to score points from the service line both in indoor competition and on the beach. My favorite, by far is the standing float serve. Once I learned and practiced tossing the ball consistently and then practiced how and where to contact the ball, this serve became my go-to ace scoring fave. 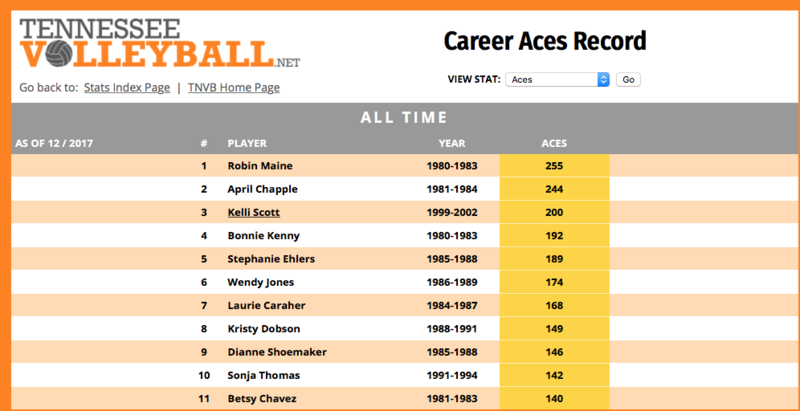 Tennessee Volleyball Season All Time Record Holders "Aces"
As a coach I think its one of the best types of serves in volleyball a young player learns. I just taught a serving clinic this week where 11 - 13 year olds who knew the basic skills but wanted to improve their float serve came to Stupak to practice their serving. By teaching them the following float serve volleyball drills and tips within 45 minutes they were consistently bombing float serves over the net both cross court and down the line. Where Are You Going To Serve The Ball? Before starting your serving routine, look at the opposing team and decide "where do I want to serve the ball?" Beginner players just serve the ball over the net, hoping that it gets in. But you aren't a beginner player. You are a player with some decent skills who's been playing for a little while and you're looking to get better so you can make a varsity team or an elite club. So you need to know who or where you are going to serve the ball. You need to have a plan. The key is to have a game plan in your head. Do you want to serve cross court? Do you want to serve down the line where that weak passer is? Do you want to serve deep to force their passers to move further away from the net? Or do you want to serve short to create some confusion for the setter and middle blocker? If you are a player with some or even a little experience you need to know where on the opposing team's court you want to serve the ball. Once you know where you want to serve, here's what you do next. Float Serve Volleyball Tips: If you are a player with some or even a little experience you need to know where on the opposing team's court you want to serve the ball. As a right handed server, line your left hip up to point directly at your serving target. Your body will be perpendicular to the service line and you should be opened up the wall to your right. The key is to know where you are going to serve before you serve, then turn and point your hip and your tossing arm, straight at your serving target. Raise your serving arm so its in a 90 degree angle with a bent elbow and open palmed hand, above the level of your right ear. Keep your elbow high, above the level of your ear, throughout the entire movement of bringing your arm forward to the ball. 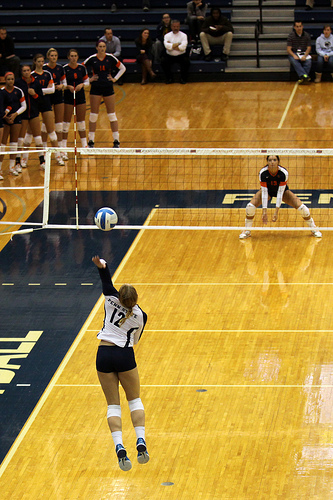 Many servers have problems serving over the net because they drop their elbow during their serving swing in an attempt to shot put the ball over. Keep your elbow above the level of your ear! The palm of your serving hand should be facing the opposite wall, not turned up at the ceiling. Keep a flat palm with fingers spread wide, as if you are about to give a teammate a high five. Your flat hand should be as flat as a ping paddle. Feet and legs are in a comfortable balanced position shoulder width apart. The key is to make sure your body isn't tilted or leaning to one side. When you turn your hips to contact the ball there's no need to add additional steps, or bounces, dips or wind ups. Your feet should stay in their starting position and only move slightly during the quarter turn to shift your body weight from your back foot to your front foot with just a tiny step in place, taken in the direction of your target. The toss done with the left extended nearly straight arm lifts the ball up and releases it, two feet in the air and if dropped, lands one foot in front of your front left foot. These requirements keep the toss in front of your serving arm. Float Serve Volleyball Tips: Keep your toss so consistent, it goes up the same height and comes down in the same spot every single time. The key is to keep your toss so consistent, that if you toss the ball ten times in a row and let it fall to the ground, it goes up the same height and comes down in the same spot every single time. 2-3 feet in the air gives your serving arm, time to keep your elbow high during your serving swing motion. You have time to get the open palmed hand to the ball without dropping the elbow, or bending your wrist, or adding funky shoulder movement that doesn't help you serve. After you toss the ball, you swivel your left hip making a quarter turn forward towards the net, at the same time you bring your right arm forward, keeping your elbow high above the level of your ear. The key is to swivel the hip and bring the hand forward at the same time to meet the ball. Many players have problems when they swivel the hip first and forget to bring the hand forward at the same time, or they drop their elbow when they swivel the hip. Hip comes forward at the same time the hand does, while keeping the elbow above the level of the ear. For the ball to float you "high five" the ball upon contact, using the middle of your very flat hand to contact the middle of the ball. The key is to keep a very wide fingered, flat palmed hand and make contact with the ball with the middle of your hand, without bending your wrist. Do exactly what you'd do if you were 'high fiving' a teammate. Reach "high five" high and keep your hand "high five" flat. The ball will float and dip and be very difficult for a passer to track and pass the ball because of your ability to contact the ball with no follow through, no spin and with a flat palmed, wide fingered "high five" contact. In the picture above of married Brazilian Olympic gold medalists Jaqueline Carvalho and Endres Murilo they both have their eyes on the ball as they hit, watching where their hand is contacting the ball during their float serve contact technique. The key is to watch your hand make contact with the middle of the ball. When players start doing this it makes an immediate positive effect on serving accuracy. When you watch your hand you can make the tiny adjustments to insure your flat hand contacts the middle of the ball, especially if your toss is a little off track. Before you serve, create a routine which you do every time you are behind the service line. The key is to slow your mind and body down while you walk back to serve and think about what you are going to do. You have plenty of time to decide who you're going to serve and then get set up to do so. Once behind the line take a look at the opposing team's serve receive pattern and look for the player or the area of the court you want to serve to. If you need to get a few bounces of the ball out of the way while doing this then go ahead. Once you know where you are going to serve, think Hip. Point your Hip so its pointing exactly where you want the ball to go. Then do the same with the shoulder of the tossing arm, placing the ball in the hand of this arm. Now raise the serving arm at a 90 degree angle in the air with your elbow above the level of your ear. Take a quick look at the elbow to be sure, its above the ear. Once the whistle blows take a deep breath and shrug your shoulders. Then toss the ball so its in front of your right serving arm, swivel hips and hand together. Watch your hand contact the middle of the ball while you "high five" the ball. The key before starting your toss is to BREATHE! Remember to take a deep breath before you toss the ball. Inhale deeply and then slowly let the air out while shrugging your shoulders. This releases tension and forces your brain and body to relax enough for you to settle down and concentrate on your next move. 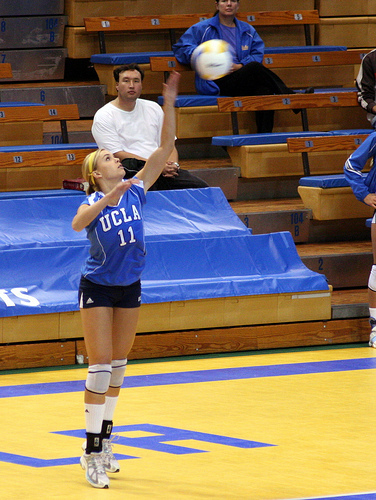 Now, you should be ready to score aces with these floater serve volleyball tips!